Wouldn't it be a really bummer if Coffman loses the race for mayor right after losing his congressional race? Perhaps there is an open seat on the RTD board for which he could run. A seat on the RTD board wouldn't be ideal for ol' Mike, but it would surely be acceptable. Ol' Mike will be just fine so long as he doesn't have to detach himself from the public teat for too long. It's Coffman's to lose, in my opinion. Aurora voters have been getting his mailers since 2009. His Congressional office was known for its constituent service, particularly on veteran's issues. Name recognition goes a long way. How many know or care that he's $rump's flunky that voted with him 96% of the time? We will see. 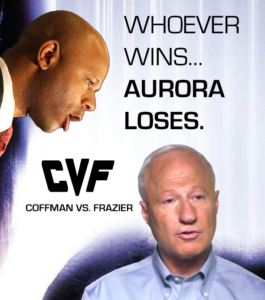 Frazier had his 15 minutes of fame when he tried to put a right to work amendment (47) in Colorado's constitution in '08,and when he challenged Ed Perlmutter in 2010. Frazier is a "Drill, baby, drill" oil and gas guy – presumably, he'll have no problem fracking near the Rocky Mountain Arsenal. Bob LeGare, the current appointed mayor, will not run for another term. Who else is running? Aurora NAACP President Omar Montgomery and former city council members Renie Peterson and Ryan Frazier have also indicated plans to run for mayor. Renie Peterson, as Mayor Pro Tem of Aurora City Council, helped push through the Gaylord Rockies Resort and Convention Center. If that's successful, and is as much of a jumpstart to Aurora's economy as she'd hoped, she might have a chance at the Mayor job. Omar Montgomery may have a decent chance at Mayor, if he also has good name recognition. Here's hoping. Some Aurora voters have been getting his mailers since 1988. That’s right – I forgot about his state Leg and Sec State years.